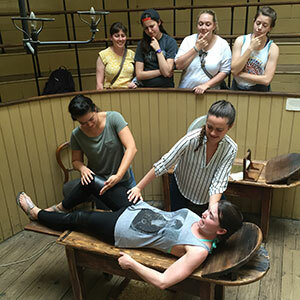 Six College of Public Health and Human Sciences students not only studied abroad in London for three weeks and earned nine public health credits this summer, they were also a part of history in the making. Led by CPHHS Assistant Professor Stephanie Grutzmacher and Head Advisor Shannon Foley, the students traveled through the city looking at public health challenges, including social determinants of health, health inequity and health in low-income countries, broadening the students’ international perspectives. Despite the region’s turmoil, the students garnered positive and lasting impressions from the experience. One of their main assignments was to create Instagram posts and a photo essay for each of their three classes. Stephanie choose Instagram as a platform because aside from Snapchat, students use it more than any other social media site. She also loves photography and believes pictures are a great communication tool for stakeholders and future participants to understand what the trip was about. Some of those places include The Old Operating Theatre Museum, public transportation, Cambridge University, the Royal Society of Medicine Library and neighborhood fruit stands. Objects representing public health appear in the posts, including bottled water with mineral content listings, public bike share stations, and messages about air quality and charitable giving. The trip wasn’t all work and no play. Pictures from the London Zoo, afternoon tea, A Midsummer Night’s Dream performance at the historic Globe Theatre, Camden Market, Windsor Castle and Big Ben solidify the group had a well-rounded experience. For Kiana Barr, a junior in Human Development and Family Science, her experience has left a lasting mark on her educational journey. Kiana even extended her trip and traveled for a week on her own in London and another week in Rotterdam, Holland.